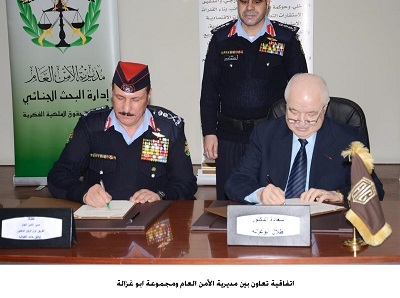 AMMAN - (Petra) –The director of the Public Security Department (PSD), General Dr. Tawfiq Tawalbeh and the chairman of Talal Abu-Ghazaleh Organization (TAG-Org), HE Dr. Talal Abu- Ghazaleh signed a memorandum of understanding between the PSD and Abu-Ghazaleh Intellectual Property (AGIP)in which both parties will cooperate in the fight against forgery, fraud, and Intellectual Property Rights infringement. General Dr. Tawalbeh assured that PSD is keen on the continuous cooperation with the local community institutions in order to serve the security process and to contribute in its development, and that PSD aims at building partnership with specialists and people concerned in the fields within the specialty of PSD. He pointed out that during the last years, a special department was established within the Crime Investigation Department (CID) to protect Intellectual Property in order to keep pace with the legislative development that granted legal protection to books, trademarks, and everything within moral and material production of ideas and creativity, which constitute a large part of our daily lives, and which relate to individuals and institutions locally and internationally. General Tawalbeh valued the cooperation with AGIP, stressing that this memorandum of understanding will open new corporation opportunities in the Intellectual Property protection domain, and in the fight against fraud, and trademark counterfeiting and piracy, and that this protection will reflect on the national economy and will prevent violation to original trademarks. Dr. Abu – Ghazaleh said that this MoU will strengthen the joint efforts of both parties to transfer expertise related to trademarks protection against fraud and violation, and will provide those in charge of Intellectual Property Protection Department with databases include trademarks owned by AGIP' clients, and also will provide them with specialists' experiences in AGIP in detecting any suspected illegal trademarks counterfeiting and piracy. He added that under this memorandum all roles will integrate to promote legal and practical knowledge in this field, and to exchange information about Intellectual Property protection. The memorandum of understanding includes the participation of the Department of Intellectual Property Protection personnel in the CID in lectures, conferences, workshops, and seminars provided by AGIP in addition to others.